View More In Threading & Cutting Tools. 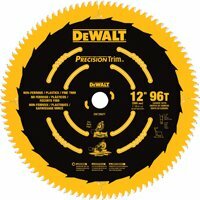 Thin kerf saw blade for for use with miter and table saws. Alternate top bevel, 7,000 maximum RPM, .071" plate, .098 kerf, -5 degree hook angle. If you have any questions about this product by DewaltProducts, contact us by completing and submitting the form below. If you are looking for a specif part number, please include it with your message.